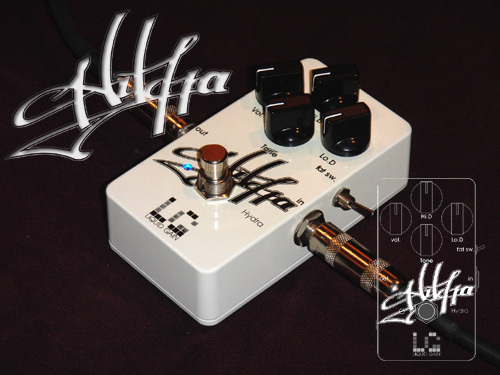 The Hydra Liquid Gain pedal was designed to provide great sound in a variety of situations. Many people aren't fans of modeling amps, and it is impractical to cart around a variety of vintage tube amps every time you play. The Hydra Liquid Gain is perfect for guitar players who want great vintage sound that cuts through the mix. The Hydra pedal is a combination preamp/ overdrive for guitars with 4 knobs and a mini toggle switch. The HI D. control allows you to shape the amount of high frequencies and harmonics, the Low D control shapes mid and low frequencies as well as overall sound presence. Switch low frequency response between fat and tight modes with the mini toggle switch. Your tone can be further modified by the internal volume trim. Find your favorite setting with the 4 knobs and toggle switch. The Hydra works well with both solid state and tube stacks or combos .Let the Hydra Drive drives your sound ! copyright. (c)2010 'Studio WING'Produced by LIQUID GAIN all right reserved.